Pets are wonderful additions to the family, but the costs of pet ownership can really add up. For a reality check of just how much you can expect to spend as a pet owner, take a look at this expense list from MoneyUnder30.com. 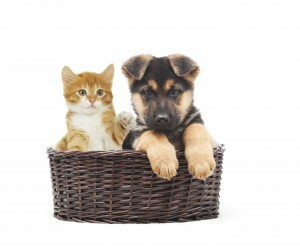 It lists annual costs to be approximately $695 for dogs, and $705 for cats. First year expenses are even more, and if your animal gets sick, vet bills can easily climb by hundreds or even thousands of dollars. Of course we love our pets, but being a pet owner means being responsible. You have to be prepared emotionally and financially to provide your furry friend with good care throughout its lifetime. Whether you already have a pet, or are thinking about getting one, here are some ways you can save on money on your pets and related care and supplies. Consider adopting a pet from a shelter or rescue organization rather than a pet store or breeder. You’ll be helping a homeless pet and adoption costs are usually donations that go toward recouping vaccination and spaying/neutering costs—and much less expensive than breeder and pet store costs. Shelters usually have a variety of dogs and cats available, including purebreds. There are also rescue groups for specific breeds such as Golden Retrievers, Bulldogs, Poodles, Siamese, and many others. If you have your heart set on a purebred dog, keep in mind that they can be at risk for more health problems than mixed breeds. This can mean high vet bills over its lifetime. If this is a concern, you may want to think about mixed breed dogs that may have lower long-term vet expenses. As PetMD says, mutts are awesome! Take a bite out of your pet care budget by shopping for food and supplies at warehouse stores or stocking up during great sales. Take advantage of your military privileges and shop at your local commissary. And don’t forget to use coupons. Read this Omni blog post for some great couponing tips. It may seem counterintuitive to bring your pets to the vet when you are trying to save money, but the truth is, preventative healthcare can save you a lot in long-term healthcare costs. Make sure your pets visit the vet at least once a year for a checkup and to stay up to date with all their vaccinations. Pet insurance works like your health insurance policy. You pay premiums, co-pays and deductibles and a percentage of your vet costs will be covered by the pet insurance policy. There are quite a few pet insurance companies to choose from, but be sure to read the policies carefully and make sure you understand what is covered and what is not before making a decision. For more information on pet insurance, visit TheBark.com. If you are going on vacation or are paying someone to pet sit or walk your dog, try networking with other pet owners to see if you can help each other out. Perhaps your pooch has a friend at the dog park. Talk to the owner and see if they would be interested in swapping pet sitting or walking services. You’ll save on boarding and professional dog walker costs, and your pup will get personal attention and a playdate. When the owner needs help, you return the favor. It’s a win-win. Regular grooming is necessary for keeping pets healthy and clean. According to Angie’s List, the average cost for standard dog grooming is between $30 and $90. To save money, learn how to do basic grooming yourself. Here are some tips from the ASPCA on bathing your dog, nail care, and more. Invest in meat-based pet food that will provide your pets with protein and other important nutrients. While better food costs more, it can help keep your pets healthy and out of the vet’s office. Also, purchase products that are well made such as a good leash, durable collar, or a sturdy kitty condo. Quality products can last for years, minimizing the need for costly replacements. Pet ownership offers priceless rewards, but it does involve a financial commitment. Do your research – if a pet fits into your budget, by all means welcome a new family member into your home. And if you already have a furry companion, use these tips to save some money and keep enjoying all the unconditional love, loyalty and comfort your pet gives every day.